Yonabaru used to be a major port where most of goods from the northern part of the island were brought by ships. 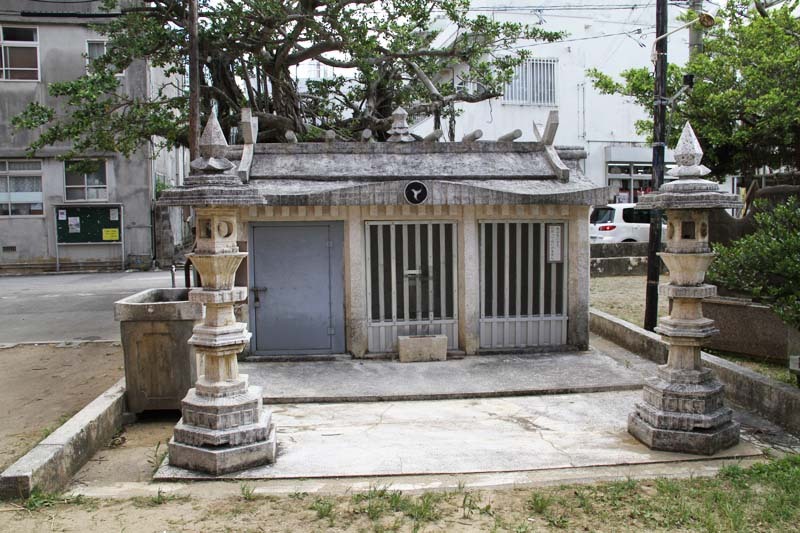 A little known historical fact of Okinawa is that it once had a railroad, and Yonabaru Town connected citizens to Naha City via a dozen stations. Yonabaru Town sits on Okinawa’s east coast facing Nakagusuku Village, about nine kilometers from the capital city of Naha. It’s one of the smallest towns on the main island and second smallest in the entire prefecture, encompassing only 5.02 square kilometers, and is often overlooked by residents and visitors alike. 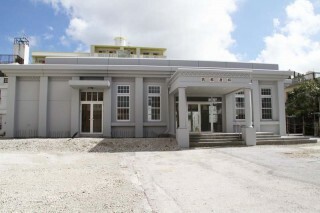 A replica of the old Yonabaru railway station has been built on its original site. 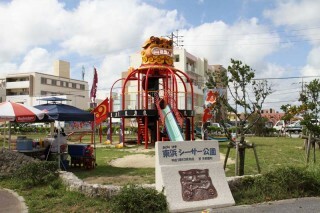 It wasn’t that way until World War II’s Battle of Okinawa, when the island’s lone railroad linked Yonabaru with Naha. The first railroad opened for service in 1914 connecting Naha and Yonabaru with a total of 12 stations. It ran until March 28, 1945. 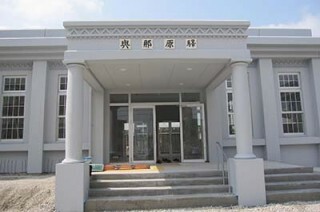 The opening of the railroad created a thriving Yonabaru Town. 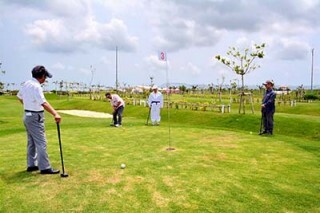 In its time it was known as the most popular place and a great city within Okinawa. In those days, when there were no cars or other types of transportation on Okinawa, it was an exciting adventure to visit the town. Until WWII, the part of the town, which faced Nakagusuku Bay, was used as a natural harbor where vessels from Yambaru would ship in. Although after WWII the port lost its function and the railroad was completely destroyed, Yonabaru Town still had one most valuable and treasured tradition left to show; its tug-of-war. 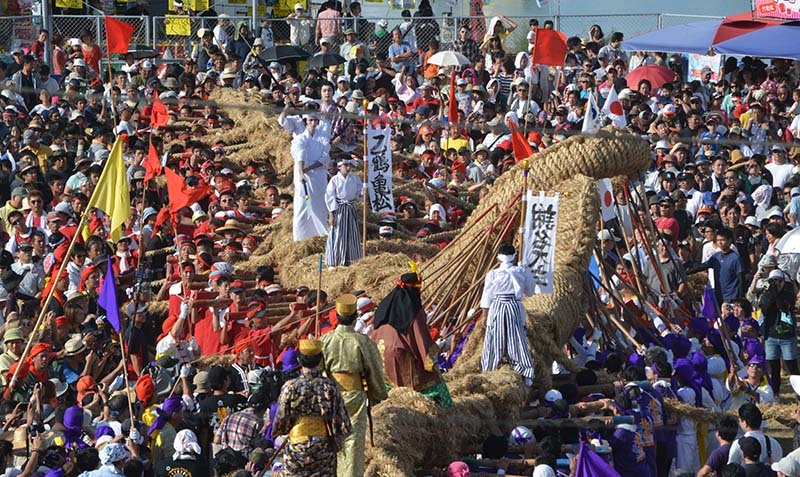 Today Yonabaru is best known for its annual tug-of-war that has a 400-year-old history. 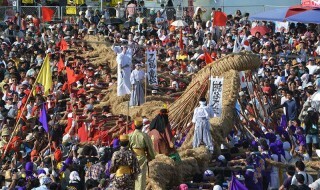 The Yonabaru tug-of-war began 400 years ago to promote a good harvest of the year. Not only local residents, but spectators from all over visited the town to experience a pull of the great tug. 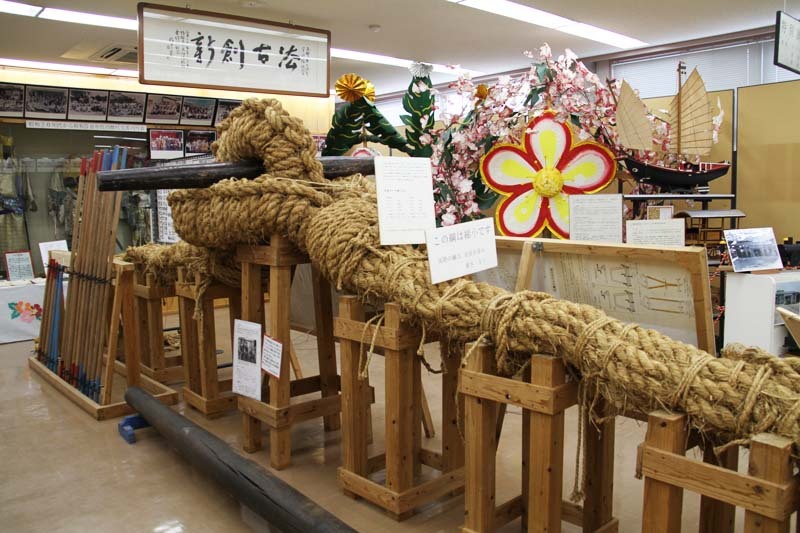 Showing the importance of the tug-of-war, there is even a museum in the town, which has documents of the history of the legendary tug-of war, and today admission is free. As one Yonabaru citizen points out, there is even an izakaya (bar and restaurant) where the owner is a lover of this event and can tell you all about its history. This year the 32nd Yonabaru Tug-of-War Festival will be happening on July 26th and 27th at the Yonabaru Golden Youth Space (map:https://goo.gl/maps/kC6rF), with many on-stage events too! Plan to visit the many delicatessens, which feature local cuisine. 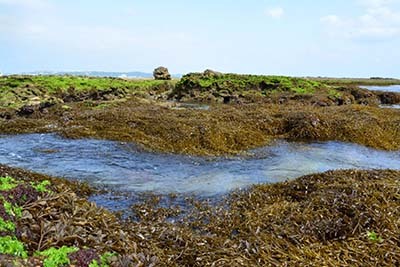 Yonabaru harvests about 55 tons of “hijiki” seaweed a year. 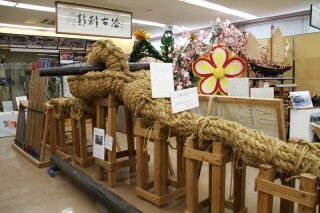 Yonabaru annually produces some 55 tons of natural hijiki (seaweed) which is distributed all over Okinawa. This seaweed is known to be full of minerals and has 500 times more calcium than milk, making it extremely healthy for the bones. Another Yonabaru trait is the red tiles (akagawara) that they make. They’re the tiles used in the Shuri Castle. 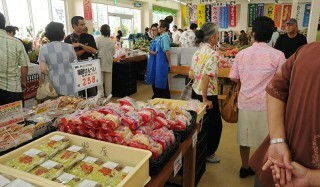 They are widely known to be the best quality, and are the most durable in Okinawa’s often turbulent typhoons and storms. 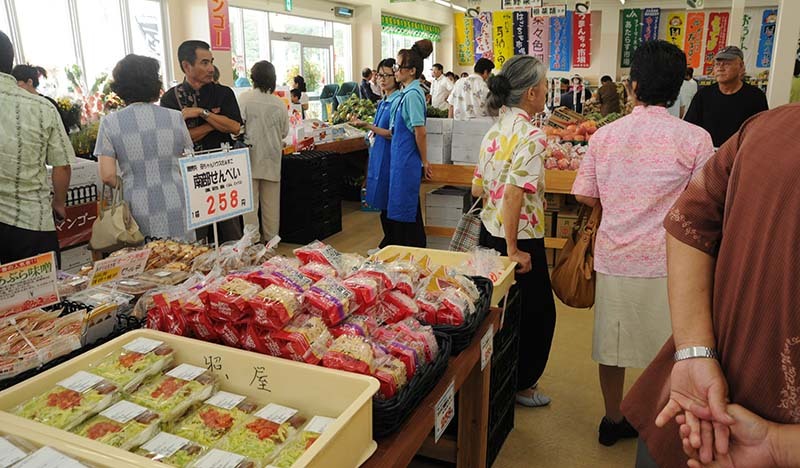 Although small, Yonabaru Town has four districts –Agarihama, Itarashiki, Ueyonabaru and Yonabaru—that all tout their contributions to the island’s history, culture and culinary tastes. Michindaki is a sacred place where the god that helps you conceive a child is said to live. 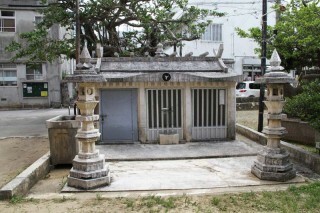 Even today, many people from all over Okinawa visit Michindaki to pray. 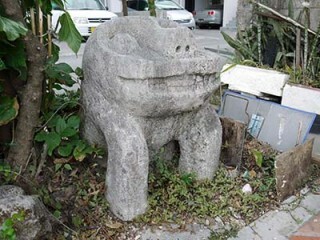 Michindaki is a generic term consisting of three (michi) sacred places (daki); “Kushidomui,” “Nakadomui” and “Naadomui”. It’s a very sacred place and it is recommended to be extremely respectful when visiting. There is no parking at Michindaki and it takes a 20-minute uphill hike from the Yonabaru Town Community Center to reach the site. The Naha-Yonabaru railroad opened on December of 1914. The railroad started from Yonabaru and the last station was at Naha Port. It was a narrow-gauge, light railway that eventually ran three separate routes; from Naha to Yonabaru, Naha to Kadena and Naha to Itoman. 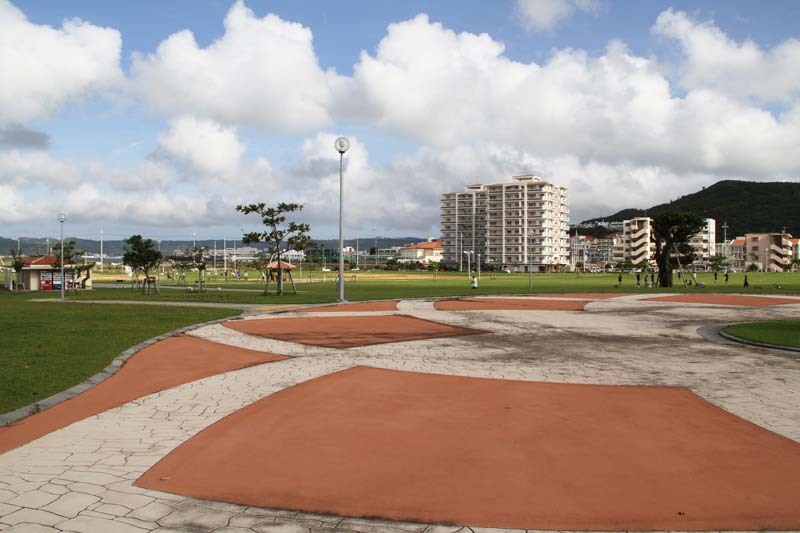 This railroad transported tons of goods and thousands of people and it boosted the growth of the town greatly until the Battle of Okinawa began. March 28th, 1945, was its last day of service before it was destroyed in the war. Nowadays, it presents a very interesting history for railroad fans. 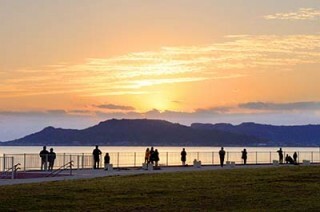 The Itarashiki District of Yonabaru faces Nakagusuku Bay, and is a fishery town. Tosoe Fishing Port is number one in Okinawa for harvesting hijiki seaweed. 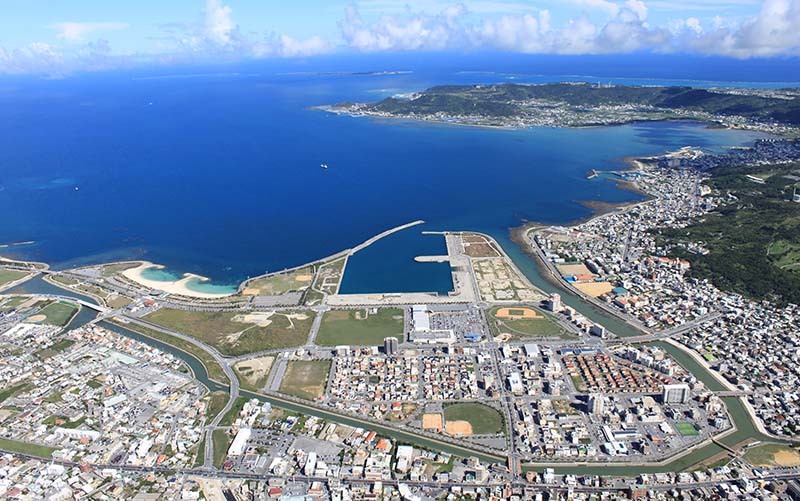 90% of hijiki distributed in Okinawa Prefecture originates from this port. Next to the port is a processing plant, where hijiki is boiled and processed within hours of harvest. The hijiki burger is one of the most popular dishes in Yonabaru, and dried hijiki and hijiki boiled in soy sauce are available in stores all over the town. The Ocean Road that winds along Nahagusuku Bay is a great place for a drive. The road is so close to the sea that it is closed and blocked for traffic during typhoons. The road is located behind the main road and a kind of hidden spot to enjoy. 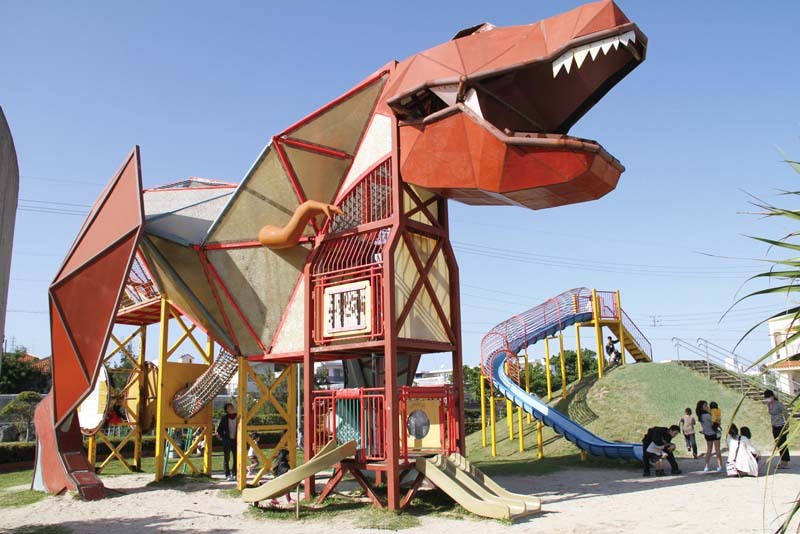 The landmark of Kyoryu Park is its playground featuring a huge dinosaur with a slide inside, a tunnel made of a net, and other fun games for children to enjoy. Next to the dinosaur are a smaller slide, two different swings and a place for foot massage. The park has many play equipment and gimmicks to entertain small children for hours on end. The swings have safety guards to prevent even smaller children from falling making it safe for them to enjoy the park. There is also a small field for playing ball. According to a legend when a heavenly maiden gave birth to her child, she used the water from Uega Well. 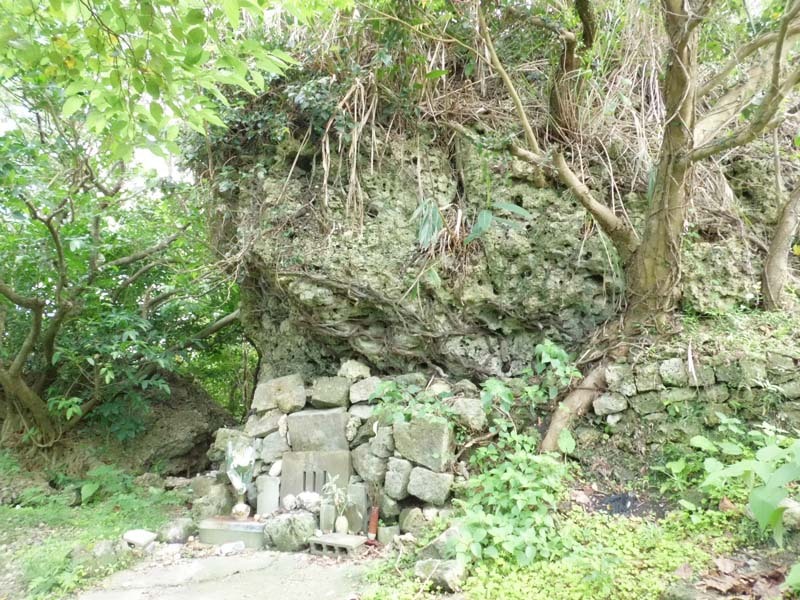 During the Ryukyu Kingdom era, a ritual called “Agariumaai” was held every year consisting of a pilgrimage to sacred places east of Shuri Castle. There are a total of 14 such places and one of them is Uega. The heavenly maiden, who came down to the eath, gave birth, and used this well to give her newborn its first bath. In the Ryukyu Kingdom era, the Kingdom’s highest priestess would place some of the well’s water on her forehead to gain spiritual power. Now, a shrine has been built on the well. The space around the shrine is surrounded by Indian coral trees (deigo) and it is also a common place for local residents for recreation and relaxation. The annual tug-of-war ritual also begins and ends here. When visiting the well, many may not see water, and that is because the well has a secret switch on the pillar. Once that switch is turned on, water will begin to come out. Those who are up to the challenge looking for the switch in order to put some water on their forehead are welcome. Just please be respectful and also careful not to misuse the water.